Mitchell Leff/GettyAntonio Callaway failed to inform his team of a recent citation for marijuana possession and driving with a suspended licence, prompting head coach Hue Jackson to punish him by making him play through an entire preseason game. 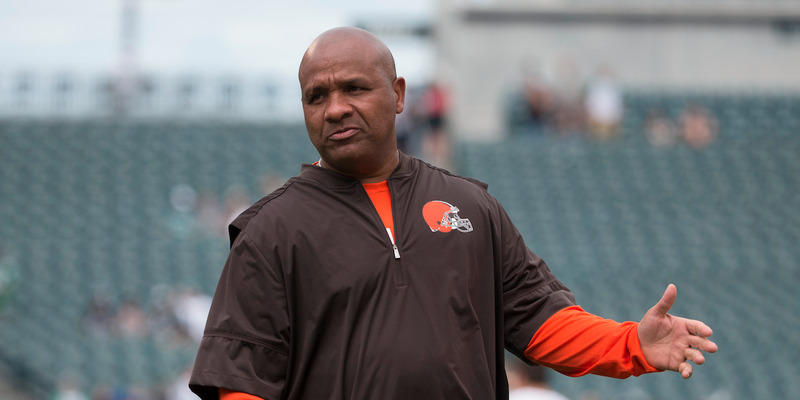 Cleveland Browns head coach Hue Jackson came up with an interesting punishment for rookie wide receiver Antonio Callaway – forcing him to play through almost every offensive snap of the team’s preseason opener. Callaway was punished for failing to inform his team that he had been cited for marijuana possession and driving with a suspended licence. Playing 78% of the Browns’ offensive snaps, Callaway finished the game with three catches for 87 yards and a touchdown. Cleveland Browns rookie wide receiver Antonio Callaway was cited for marijuana possession and driving with a suspended licence in early August. When he failed to inform the team of the infraction until the news broke, Cleveland head coach Hue Jackson came up with an interesting form of punishment – forcing Callaway to play the entirety of the Browns’ preseason opener. Callaway would wind up on the field for 54 plays on Thursday night, playing 78% of the Browns’ offensive snaps, and finish with three catches for 87 yards and a touchdown from fellow rookie Baker Mayfield. Jackson said he appreciated the effort Callaway put in through the punishment. While Jackson might be pleased with how the punishment turned out, he might want to consider adjusting his methods if there are any further transgressions – after the game, Callaway would wind up with a rib injury that left him limited in practice on Sunday.